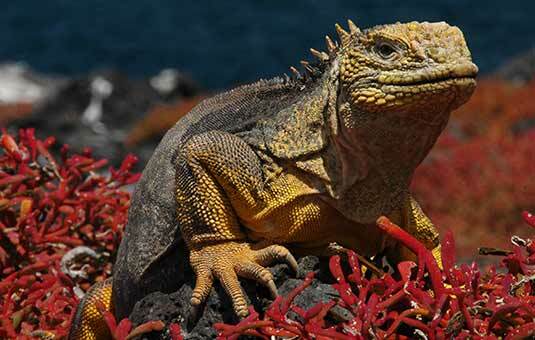 The Galapagos Islands are a paradise for reptiles: the conditions are perfect for iguanas, lizards and tortoises. 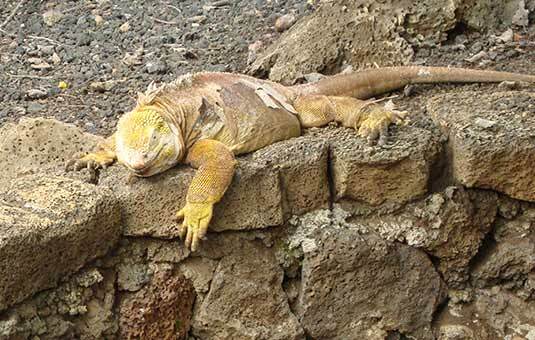 Reptiles historically had an advantage over mammals when it came to arriving to the islands: it is thought that most land animals that arrived by chance into the Galapagos came clinging to clumps of vegetation or wood set adrift from the mainland. Mammals need more water and were much less likely to survive the journey to the Galapagos Islands, whereas reptiles had the endurance for the trip. 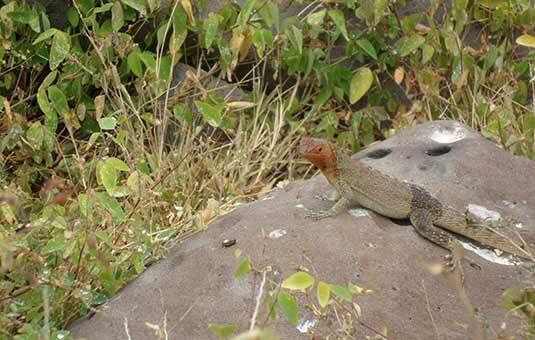 Once they arrived to Galapagos, reptiles soon began to thrive and adapt themselves to the available ecological niches. Over the millennia, these reptiles have changed so much that they no longer resemble their ancestors who arrived to the islands so long ago. 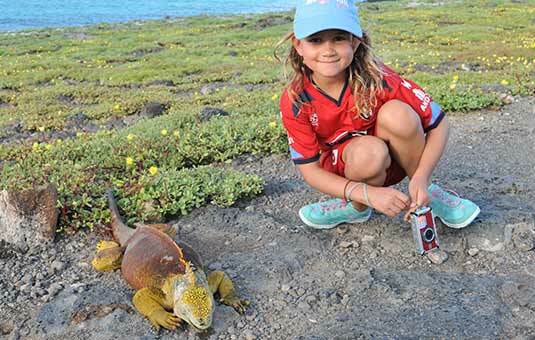 The Galapagos reptiles evolved in remarkable ways, and most reptiles found in the islands are now considered endemic, meaning they are not found anywhere else in the world. 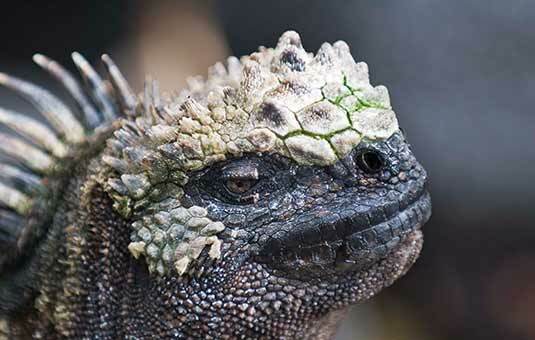 Here are some of the more extraordinary endemic Galapagos reptiles. 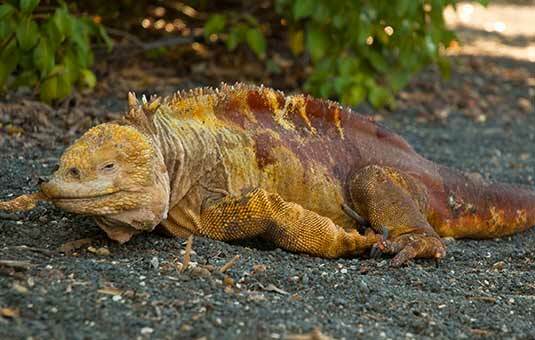 The reptiles of the Galapagos Islands are a fascinating bunch. 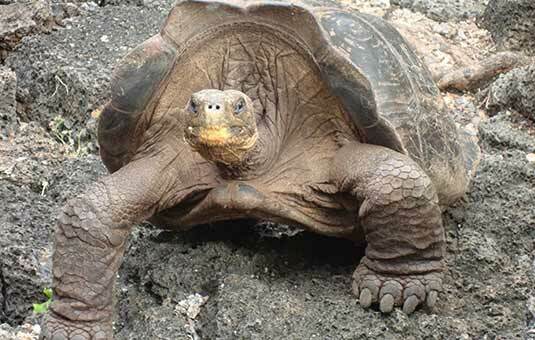 Unlike birds, reptiles cannot fly to Galapagos, so all of them had to get there by accident. 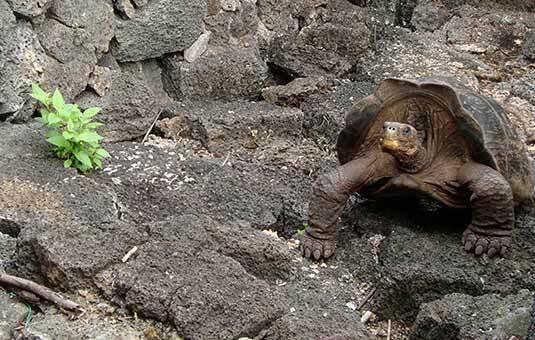 Reptiles such as snakes, tortoises and iguanas presumably were washed off of the mainland somehow clinging to floating material such as fallen trees or reeds, arriving at Galapagos after some weeks at sea. Once there, they all had to adapt to the harsh Galapagos environment. 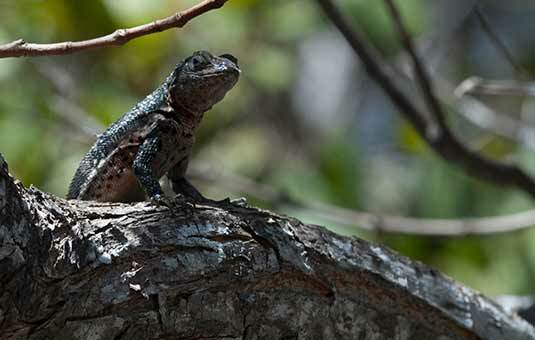 The Galapagos marine iguanas are a good example: their mainland ancestors lived in trees, eating fruit. Once in Galapagos, they adapted to eating underwater algae and living on rocky shores. 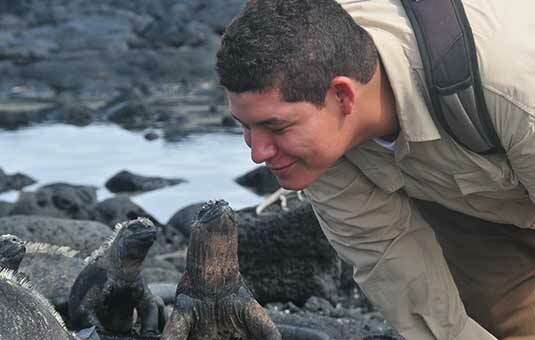 Like all reptiles, the species in Galapagos have life cycles of mating, nesting, marking territory, etc. If you want to see your favorite species, follow this helpful guide! There are no large land mammals native to the Galapagos: herbivores such as goats were introduced later. 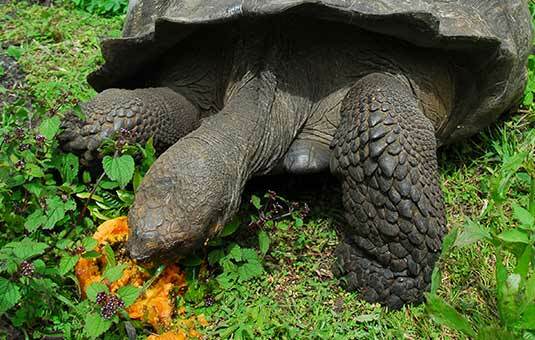 The Galapagos Tortoise found that with such a ready supply of food and no predators, they could grow, and they evolved into the massive, lumbering creatures visitors see on the Islands today. They are perfectly adapted to the cool highlands where there is plenty of lush vegetation and lots of mud for them to wallow in. 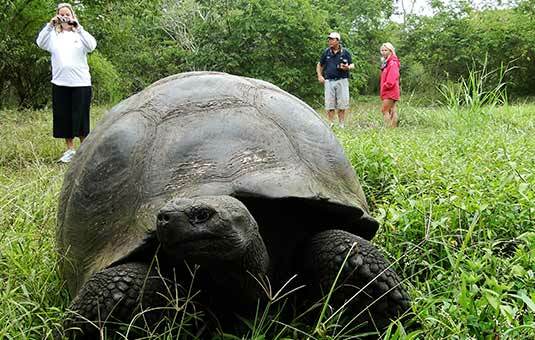 The Galapagos Giant Tortoise is perhaps the most famous of all Galapagos species, the animal that most visitors want to see! These gentle giants were once abundant on several islands, but early whaling ships and pirates often carried them off because they can survive for a long time at sea without food or water, providing fresh meat for sailors who have been away from land for a while. The Floreana subspecies, for example, was still abundant when Charles Darwin visited in 1835, but by 1846 it was extinct. 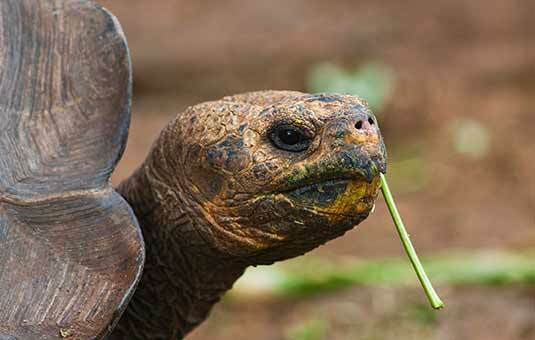 Although pirates and sailors hunted these astounding creatures, negatively impacting their populations, recent conservation efforts for the remaining Galapagos Giant Tortoise subspecies have been very successful. There are now more of them living now in the wild since before passing ships started capturing them hundreds of years ago. The best places to see them are at any one of the three breeding stations: there is one each on San Cristobal, Santa Cruz and Isabela Islands. 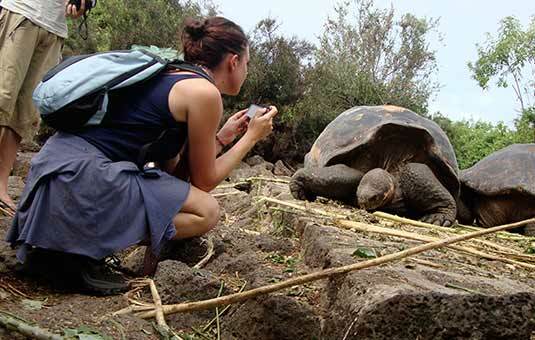 On Santa Cruz in Puerto Ayora you'll find them at the Charles Darwin Research Station, which is home to the most famous of all Galapagos Island Tortoises: Lonesome George, the last surviving individual of the Pinta Island subspecies. 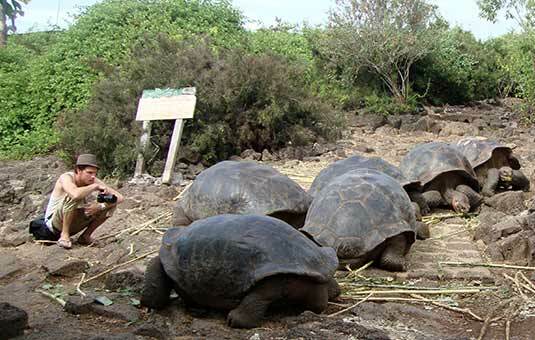 It's also possible to see the Giant Tortoises in their native habitat, the island highlands (generally on Santa Cruz). There are usually some there year-round, but the best time to see them is from June to December, when most of them have come up from the lowlands. Where is it found: In the wild at Isabela, Pinzon, La Pinta, Santiago, Santa Cruz, San Cristobal and Española. When is it found: All year round. 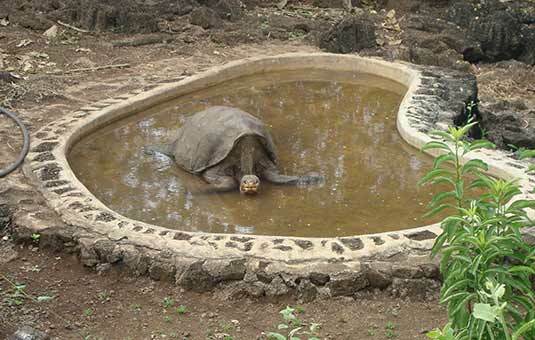 Interesting fact: The largest living species of tortoise, reaching weights of over 400kg and lengths of 1.8mt. 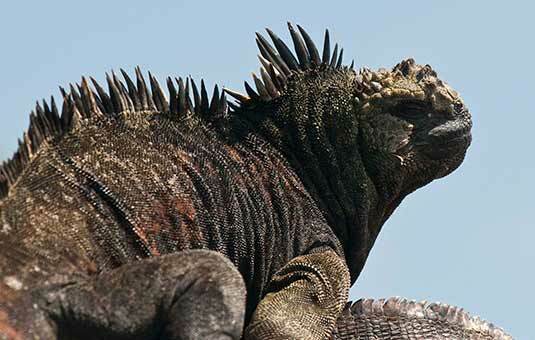 The Galapagos Marine Iguana is truly one of the most striking animals in the Islands. These dark colored iguanas feed underwater, gnawing algae off of rocks that are sometimes as deep as 15 meters (50 feet)! Its body temperature can drop several degrees while feeding, so they are commonly seen soaking up sunshine on lava rocks, bringing their temperature back to a normal level. They are common throughout the islands and a favorite among visitors. 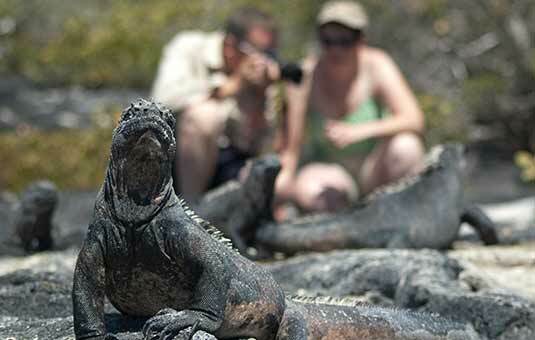 A most remarkable animal, the marine iguana can be seen year-round at many Galapagos visitor sites. On Punta Suarez (Española) lives a variety of the marine iguana with green and red coloring: it is sometimes called the "Christmas Iguana." 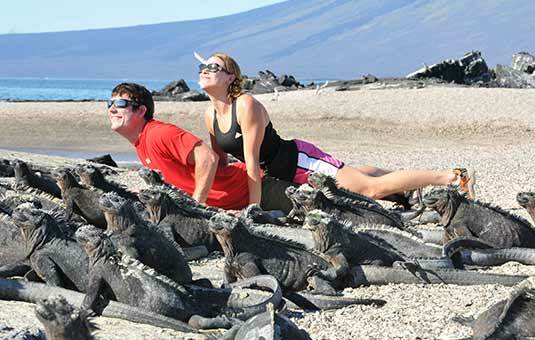 The mating season for marine iguanas begins at a different time on different islands, but generally around November-December. Males can often be seen in December "fighting" one another by butting heads: this is to establish dominance. In January and February, females dig a nest and lay the eggs, which begin to hatch in late May. 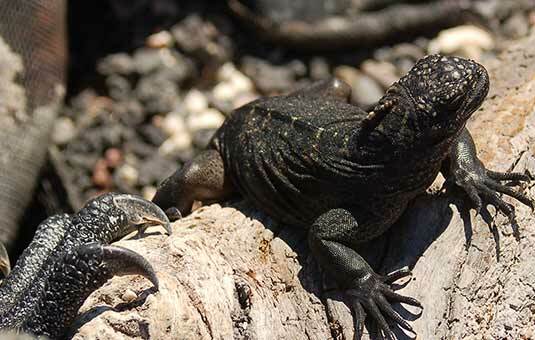 June is a great time to see cute baby marine iguanas! Where is it found: Can be found on most islands in the archipelago, at the shoreline. Interesting fact: Found only on the Galapagos Islands, has the unique ability to live and forage in the sea. 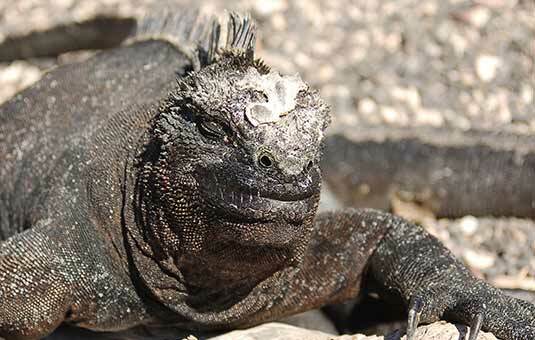 The land iguanas more closely resemble their mainland cousins, both in appearance and diet, than the marine iguanas. 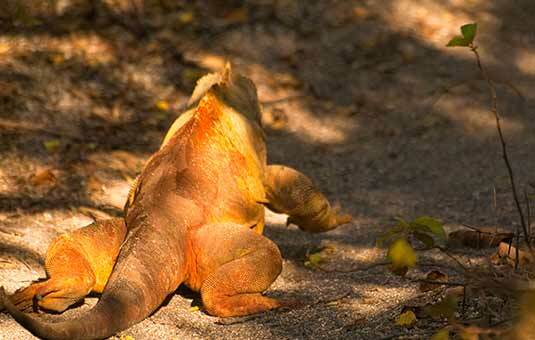 As iguanas go, they are quite large and their bright yellow color makes them a remarkable sight. They are commonly seen lumbering through dry scrubland and eating vegetation. One of their favorite foods is cactus pads, which they eat spines and all: the thick skin on their mouths makes them able to do so without having to go see the dentist! Galapagos land iguanas are larger than their marine cousins, and they're more colorful as well: they're a dull golden yellow. They're vegetarians, preferring tender cacti and fruit. Also unlike marine iguanas, it's rare to see more than one at a time. There are some at the Charles Darwin Research Station, where they're protected and can breed in captivity. 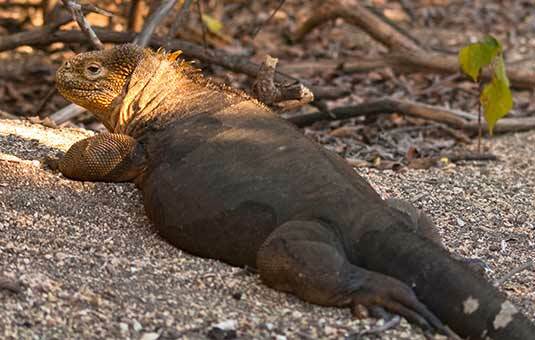 Recently, scientists discovered another species of land iguana, the Galapagos Pink Iguana. There is only a very small population of these pink iguanas on one of the volcanoes on Isabela Island: at present it is not possible to visit the site and see the iguanas. Where is it found: Endemic to the Galapagos Islands, is primarily found on the islands of Fernandina, Isabela, Santa Cruz, North Seymour, Hood and South Plaza. 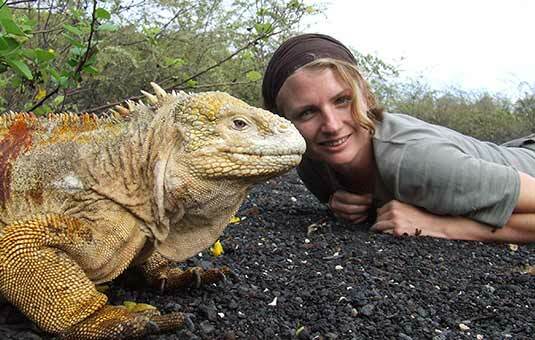 Interesting fact: They enjoy a symbiotic relationship with birds; the birds remove parasites and ticks, providing relief to the iguanas and food for the birds. 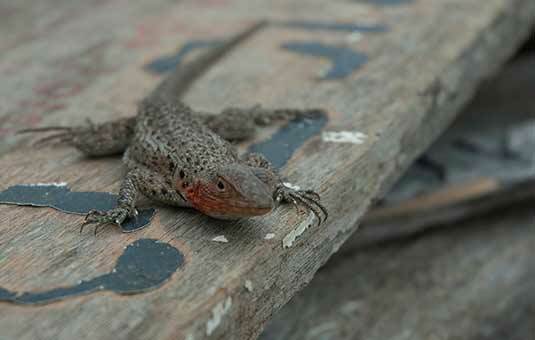 It seems everywhere you go in the Galapagos, little lava lizards scurry about. 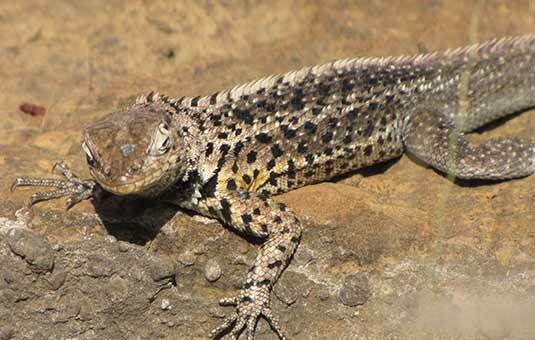 These small lizards, some reaching a foot long or more, hang out on rocks or in scrubby vegetation. 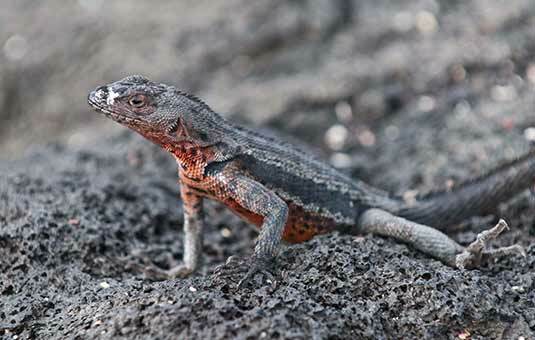 Actually, there are seven subspecies of lava lizards in the islands: they have been on the different islands long enough to develop different characteristics according to the environment of each island. 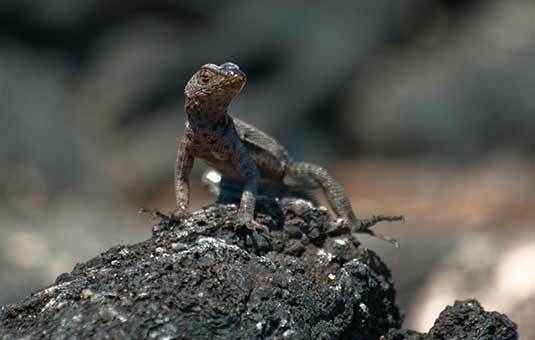 If you show an experienced guide a photo of a lava lizard, he or she will be able to tell you on which island the photo was taken! 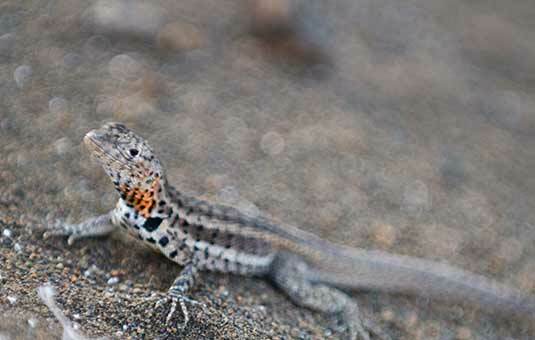 Visible at almost all visitor sites, Galapagos Lava Lizards are small, quick lizards who mostly eat insects. There are different species on different islands: the largest is the Española variety. They are territorial and can often be seen doing "push-ups," an action that marks their territory. Where is it found: Can be found on most islands in the archipelago. 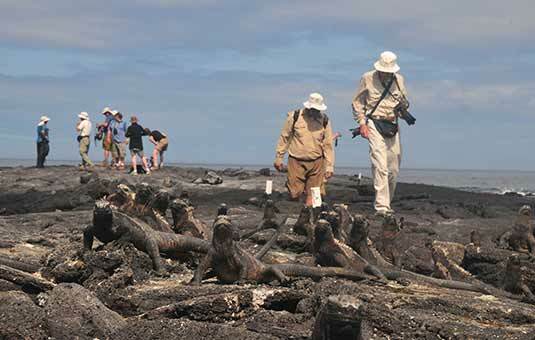 Interesting fact: There are at least 28 species, including seven which are endemic to the Galapagos Islands. 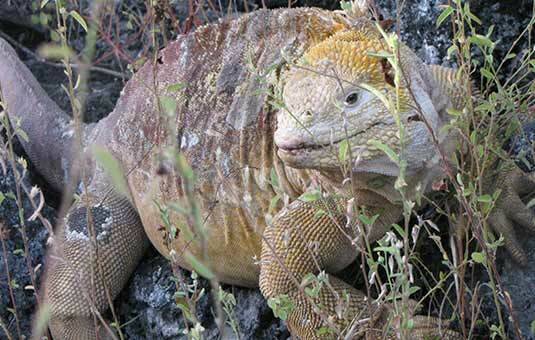 There is a species of iguana known at the "pink iguana" living in the highlands of Isabela: they are unrelated to the regular, more common land iguanas found elsewhere. Also, there are four subspecies of snakes in Galapagos, all of which are endemic and look mostly the same: small, harmless brownish snakes much like garter snakes common around the world. The Hood Racer is found only on Española, the Banded Galapagos snake is only on Fernandina, Isabela and Pinzon, the Striped Galapagos Snake is on Baltra, Seymour, Rabida, Santiago and Santa Cruz and the Galapagos Racer is on most of the islands. The snakes are all small and shy: they're constrictors who prey on small lizards and iguanas, insects and nestling birds. 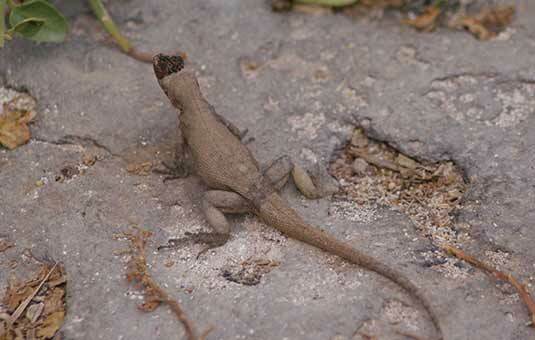 There are six endemic and three introduced species of gecko in the Galapagos. They're nocturnal and eat insects and can often be seen climbing walls, windows or ceilings. They're found on most of the islands but are generally hard to see unless one comes into your hotel room!